The distinctive portraits of James Bama have earned him the respect of art collectors and critics worldwide. 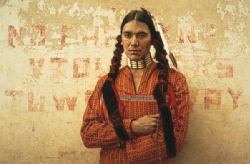 The focus of Contemporary Sioux Indian is Oglala Sioux Wendy Irving, a modern-day Indian whose choker necklace, ribbon shirt and braids wrapped in otter skin indicate that he clings to the traditions of his people, yet finds himself caught between two worlds. To give the painting a contemporary flavor Bama placed him against a peeling wall that warns, "No Parking, Violators Towed Away," suggesting that the Indian does not fit in the white man's affluent neighborhood." These are sophisticated young Indians, very aware of what is going on," says Bama." They are not about to sit back passively and endure injustices. They seem limited in what they can do other than become educated and find a niche in the white man's world where their old ways have been accorded little or no place.